The big list of Wedding Transport In Ireland - Wedding Car & Limo Hire, Vintage Cars, Motorcycles, Helicopters, Horse & Carriage, Buses, Coaches & more. 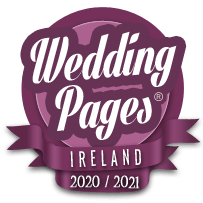 We are the only website dedicated to finding & listing EVERY Wedding Car & Limo Hire, Vintage Car, Wedding Motorcycle Hire, Helicopter, Horse & Carriage, Bus & Coach Hire in Ireland. Inside you'll see videos, photos, live Facebook updates, phone, website and email links - you can even enquire directly with the suppliers right there on the page.. 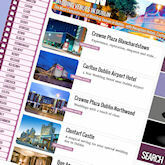 This is, quite simply, the largest & most comprehensive wedding car & transport directory you will find. 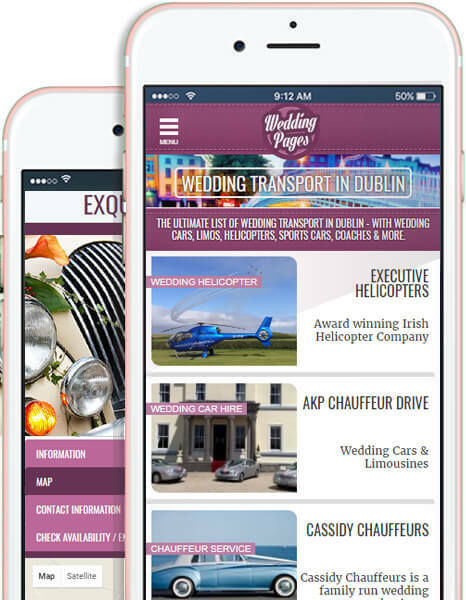 The best wedding transport providers in Ireland don't always have to advertise, and even if they do, they may not show up in your internet search - We find them all & list them for you. Browse all the Wedding Car & Transport companies in your area - and while all the other sites only list paying advertisers, we're independent and list everybody - Guaranteeing you the widest choice. Making phone calls & composing emails is a pain. Use our Quick Enquiry feature to check directly with the suppliers you like - Simple.